Is everyone enjoying their Valentine’s day? I myself have been working overtime instead, not by choice though. But I have managed to unbox some new figures and take, er, one photo of them! Rin Tohsaka is showing how it’s done properly! If you really want your loved one(s) to know your feelings then there’s 1) make sure you let them know (don’t keep it to yourself), 2) don’t lie about how much you love them (notice Rin made a lot of hearts) and 3) tell them sooner than later (they’re still in school but Rin waited till it was evening). 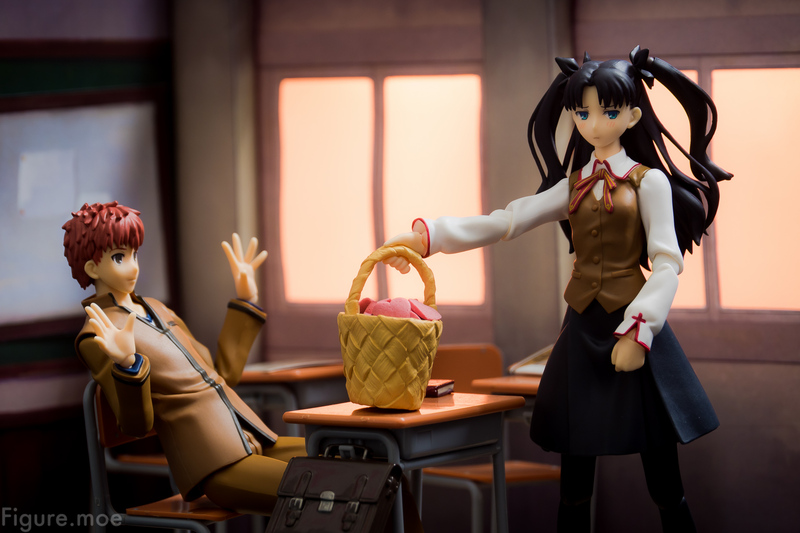 I’m not sure if Emiya Shirou is overwhelmed or just surprised cause Rin slammed the basket onto the table. In any case, I for one think Rin is really cute like this, she’s one of my favorite characters after all! Emiya Shirou is actually my first male figure. Can you imagine? He’s a fun (though rarely smiling), tough and quirky little guy, but the biggest reason I got him was for him to keep Rin company. They’re such a great pair, after all!